So tomorrow, here in Britain, it's decision day as we go to the polls, and this time, we have a choice of three -- that's the present Prime Minister, the Labour Party's Gordon Brown, the Conservative leader David Cameron, and a Liberal Democrat called Nick Clegg. During the short but gruelling campaign, I've spent time with all of them as they crossed the country in a bitterly-fought contest. Now we have this three way competition because we finally caught up with you and staged our first ever series of TV debates. Politicians here are very unpopular, largely due to the exposure of their rather dodgy expenses system. So Nick Clegg, the young outsider, had several advantages in those widely-viewed debates. He looked good, he sounded sincere, and most importantly he seemed to have nothing to with the old corrupt system. He was our Ross Perot, and his support rocketed after the first debate. But some of his early shine started to fade after closer examination of his party's policies, although he still runs level with Prime Minister Brown -- with David Cameron in the lead. Poor Mr. Brown has had a rotten campaign, culminating in a bizarre confrontation when he accused one of his own supporters, out of earshot, of being bigoted. Unfortunately he forgot the TV microphone still attached to his jacket. And just when he thought he'd got away with that, yesterday one of his own candidates described him as 'the worst Prime Minister Britain has ever had'. That's one of his own candidates. But even though Mr. Brown is in such trouble, our first past the post voting system means that he will probably end up with double the number of seats the Liberal Democrats get. He might even try to do a deal with them and hold on to power. The Conservatives are unlikely to win enough seats to get a majority. So David Cameron may have to do his own deal with the Liberal Democrats, or try to form a minority government and hope for the best. And to add to the fun the first task of whoever does struggle into 10 Downing Street will be to make savage cuts in public spending and put up taxes to deal with our massive deficit. So the doomsday scenario is of a country with nobody really in charge -- certainly, nobody with the authority to fix our economic crisis. During the campaign, we suffered from the impact of a volcanic ash cloud which grounded all flights in and out of the country. The threat of that cloud turned out to be illlusory. The threat of economic and political meltdown is more real and more dangerous. 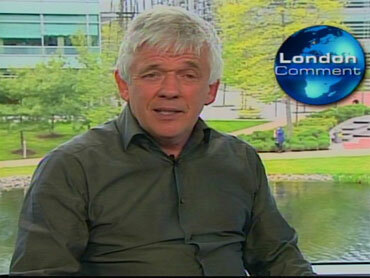 This is Peter Allen for CBS News in London.